On Standing Rock Sioux Reservation in North Dakota, Native American Tribes are standing against development of a 1,172 mile oil pipeline. The Dakota Access Pipeline, or DAPL, is designed to cross hundreds of waterways including the Missouri and Mississippi Rivers. Water protectorsare led by indigenous peoples and joined by non-native allies from around the country and world to call attention to DAPL and water security. More than 240 recognized Tribes, and dozens more Indigenous People from around the world, stand in solidarity with Standing Rock against this threat of potential contamination of our longest and largest national water basins. While recently the US Army Corps of Engineers denied the permit to the pipeline company to route under the river, the fight is not over. 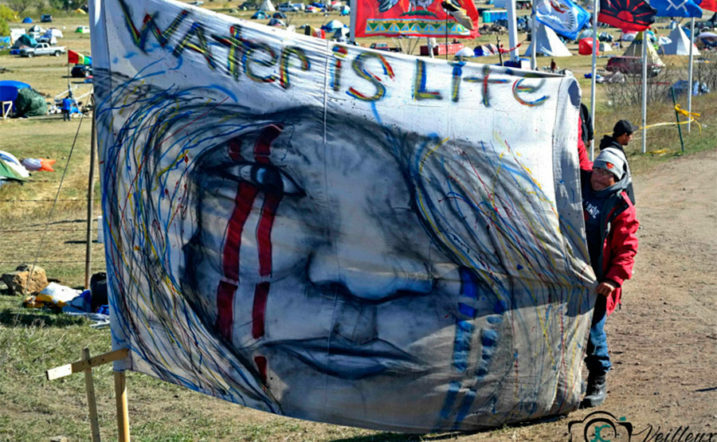 The water protectors stand unwavering under the banner of Mni Wiconi, Lakota words that express: Water is Life. Jennifer is using water science and geospatial analysis to describe threats from this pipeline to the Indigenous People and will share her experience working with the Elders and Tribal Governments from the Missouri River Basin on these issues. She will also share photographs has been taking to document this historic time.